Q&A, What do we do in Seili in winter? Some of the most frequently asked questions we get is “What is it like to work and live in Seili in wintertime?” “What do you do in Seili during winter?” and “How can I travel to Seili in winter?” The institute has operated in Seili year round since its beginning and our actions are generally governed by the busy summer field season and the more peaceful winter season. 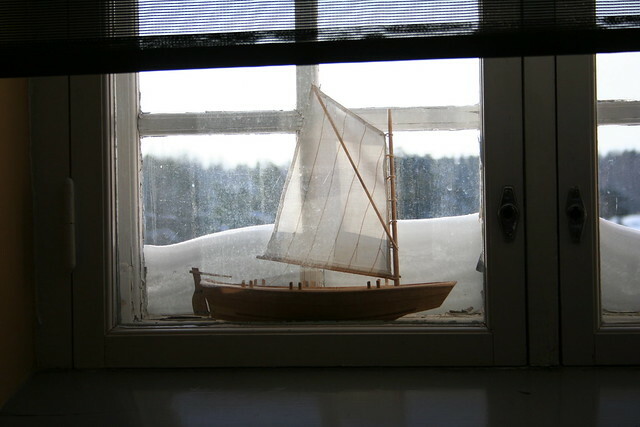 When summer turns to autumn and winter and the ferry m/s Östern, operating between Nauvo, Seili and Hanka, ends its summer season, we turn our focus towards the upcoming winter. Even though the weather might still be sunny and warm, the approaching winter season is obvious as one by one the summer employees leave the island and visiting researchers end their field work and experiments for the year. What remains is the core group that takes care of the infrastructure. As things slow down on the island, the University campus is starting the new academic year, which means that the number of university board meetings etc. increases exponentially. For this reason, a part of our staff move their office for the winter to the Turku university campus area (Matthias-building) and work in Seili only occasionally. 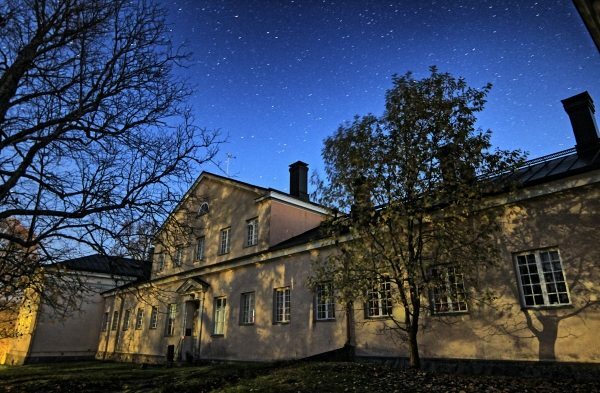 A great weekend getaway for photographers and astronomical enthusiasts. The city lights won’t bother you here, but instead, pack a headlamp. For those who work in Seili full-time year round, the wintertime is devoted for maintenance tasks. During winter, sampling equipment are inspected and, if needed, repaired and calibrated, and lab stores are refilled for the next summer. Our service men, Pete and Kari, also take the Institute’s vessels and boats out of water and make sure they are ready for the next season. This winter, there are also several renovations going on, something new is under construction.. The lights at the workshop don’t go out in winter. The peaceful wintertime is devoted to maintaining the infrastructure at Seili. In autumn, some of the sampling programs, like the moth monitoring, end when the temperatures fall below 0 degrees. One of last big sampling efforts is the fishing of herring for The Finnish Radiation and Nuclear Safety Authority’s (STUK) monitoring purposes. The water quality monitoring, however, is continued year round, and every ca. 10 days the Institute’s preparator, together with Kari or Pete, travel to the sampling point, located north of Seili, to take water samples and measure the temperature and salinity of the water column. Every month, zooplankton samples are also collected. The wintertime sampling is mainly governed by ice and wind-conditions, but usually only during rasputitsa the monitoring cannot be continued as it is not either possible or safe to travel to the sampling point with a boat, snowmobile or hydrocopter. 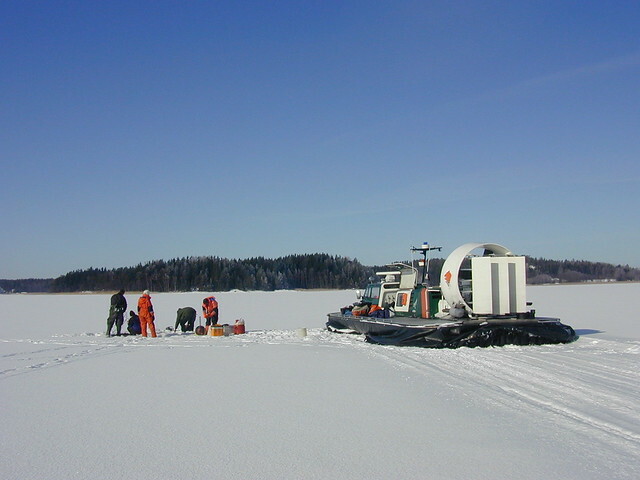 Sampling in winter 2006. Exceptionally, the trip from Seili post jetty to the sampling location was done with a hover craft. 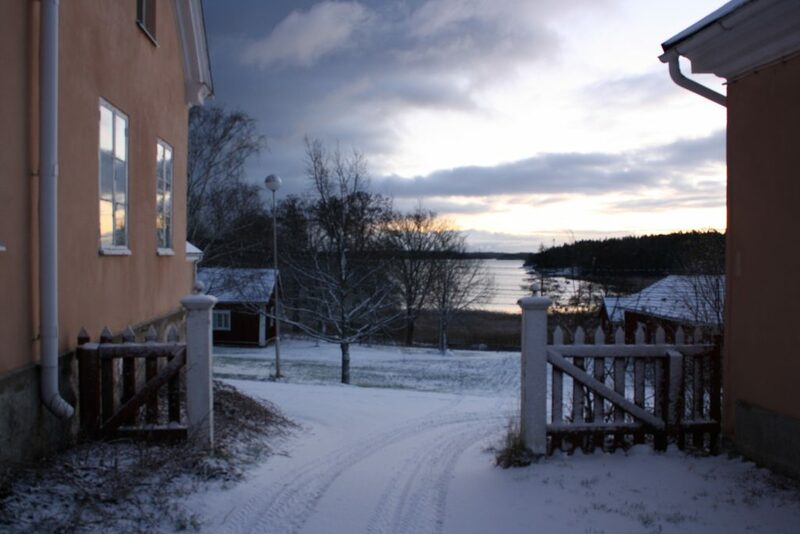 It is easy to travel to Seili even in the wintertime. After the summer season, a public ferry, m/s Falkö operates between Nauvo and Seili. The biggest differences is in the timetables, in winter, it is possible to travel to Seili and back only on Tuesday, Wednesday and Friday. The ferry ride also needs to be booked at latest the day before. This winter, the Nauvo guest harbour is also under construction and thus, the ferry operates from Keso shipyard in Ernholm, Nauvo. Interested in traveling to Seili in winter, but the ferry timetables don’t fit your schedule? We offer transportation services year round. More information and price list here. In the eastern side of the Seili island, on top of a leading mark, is a nesting Osprey (Pandion haliaetus) couple totally unaware of its fame. The breeding of this second largest predatory bird species in Finland has been monitored through a web camera since 2006. The Osprey web camera was installed in Seili by the Turku University of Applied Sciences as part of NatureIT-projects and later, continued as part of Saaristomeri.info and BalticSeaNow projects. 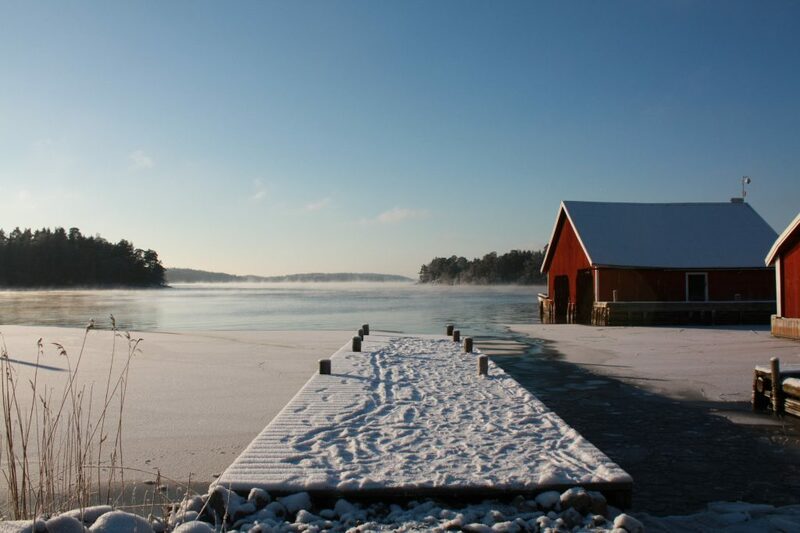 The last project, EU-funded BalticSeaNow ended in February 2013.  Since 2015, the Archipelago Research Institute has participated in the maintenance and funding of the web camera and connections. The latest addition to the camera was a microphone, added to the camera assembly in 2016, so that sound can be transmitted. 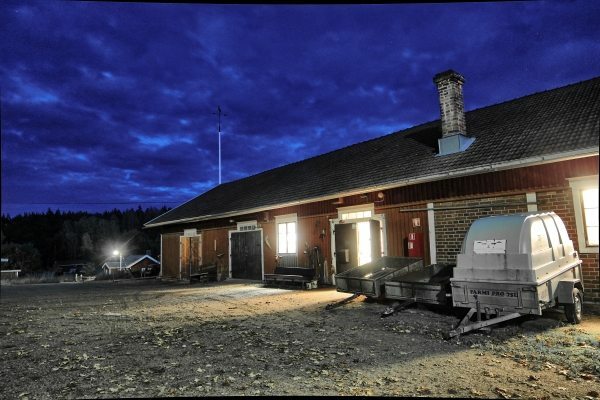 The Osprey cam can be found in the Saaristomeri.utu.fi website, updated and administered by the Archipelago Institute. Like several other web cameras in Finland and worldwide, the Osprey cam of Seili has been very popular since its beginning. At its best, the ospreys have reached one million views per year! The camera is operated year round. During winter, viewers can admire the changing archipelago scenery and white-tailed eagles, crows, and ravens, occasionally visiting the nest. At the moment, it is quiet, only the whistling sound of wind is heard through the speakers. The male osprey, called Vasuri (loose translation “lefty” or “left hand”), and the oldest two chicks, unofficially called Pomo (“the boss”) and Kakkonen (loose translation “the second” or “number two”), started the migration to Africa in August. The year has been a dramatic one for the osprey couple. The female osprey, called Tilda, disappeared from the nest in June. The couple had been nesting in Seili since 2011; before that, e.g. an osprey couple, called Tapani and Liisa, occupied the nest. This spring, Tilda and Vasuri laid 3 eggs. The chicks were ringed in June. After the disappearance of Tilda, another dramatic event occurred in July, when the youngest sibling fell from the nest to its death as a result of food competition with the older siblings. This sort of behaviour, called siblicide, is rather common among birds and has been found to e.g. improve the survival of the remaining young (for more information on avian siblicide see e.g Mock et al. 1990). Next spring, in March-April, when the ospreys return from their wintering grounds, nature’s drama continues and it remains to be seen whether Vasuri will return to the nest or will the nest be occupied by a totally new osprey couple..
Kontkanen & Nevalainen, 2002. Petolinnut ja metsätalous. Siipirikko 29(2): 1-80 (In Finnish).